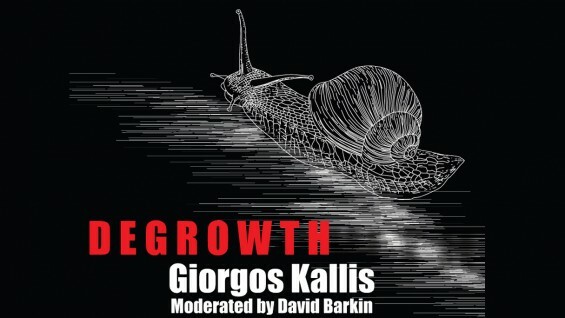 Degrowth is the vision of economies that are socially and ecologically sustainable and do not grow or care to grow. In this presentation two arguments will be developed: First, that economic growth is not and should not be the answer to the crisis. Evidence will be given to support the claims that global economic growth is ecologically unsustainable, and that in the long term, growth in advanced European or American economies may not even be possible. Second, that there are alternatives to growth and that we need to study them and understand them better. Why and how does growth remain the core objective of most nations? Can we consider institutions that decouple prosperity from growth? Giorgos Kallis is a Professor at the Institute of Environmental Science and Technology in Barcelona and an environmental scientist working on ecological economics and political ecology. He holds a Ph.D. in Environmental Policy from the University of the Aegean in Greece, a Masters in Economics from Universitat PompeuFabra, and a Masters in Environmental Engineering and a Bachelors in Chemistry, both from Imperial College, London. His current research explores prospects for a smooth global economic downscaling toward a sustainable future in which we can live better with less. Dr. David Barkin (Ph.D. Yale, 1966) is distinguished Professor of Economics at the Universidad Autónoma Metropolitana, Xochimilco Campus, Mexico City. He was a founding member of the Ecodevelopment Center in 1974 and received the National Prize in Political Economy in 1979. Currently he directs work with community groups to promote local capacities for self-government and ecosystem management.